Thank you for your interest in having packing supplies delivered to your home. 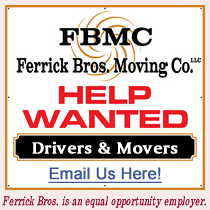 If you would like to more information about our available Packing Supplies, please use the form below and a Ferrick Bros. Moving Company representative will contact you shortly. Note: Online estimates are not as accurate as getting a quote from the owner, Bob Ferrick, either on the telephone (978) 225-0158 or a free, in-house estimate. Note: You will receive a copy of your Contact Form via the e-mail address entered above. Please note that all contact information will be kept confidential and will not be sold or released. Click HERE for estimate via e-mail! Buying or Selling Furniture? Click Here! A Family Owned And Operated Business Serving All Of New England, N.Y., N.J.